In this article i am going to list some of the most popular and best WordPress plugins to create FAQ’s pages. It is not difficult to create FAQ pages, WordPress makes it very simple and easy but with WordPress FAQ plugins you can create user-friendly and visually appealing Frequently Asked Questions pages. Frequently Asked Questions pages, commonly referred to as FAQ pages, are common online, especially on business websites and blogs. FAQ pages can be a great tool for many reasons, but only if you use them the right way. Normally most FAQ pages are designed to relieve the requirements of online customer support. Sometimes customers ask the same question again and again. To answer them all via email is not easy, it is a waste of time. With FAQ pages you can quickly share answers to common questions held by visitors and customers. How to create Best FAQ Pages with WordPress? Here are a few tips for making great, and useful, FAQ pages. FAQ’s (Frequently Asked Questions) section of your small business blog is very important, if you are offering some kind of online services and selling products, you must have an FAQ’s page on your website. With a good FAQ’s page, you can make it easy for your visitors to learn more about your products and services. 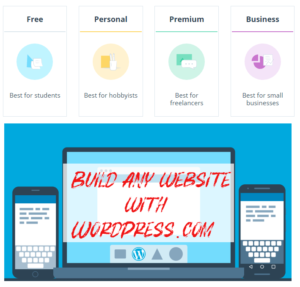 Creating FAQ page on your WordPress website is not difficult at all, you can use many free plugins but make sure that FAQ pages are well organized. Make it easy for visitors to find what they are looking for, break down Questions into common categories. It allows you to add a real FAQ system, efficient and easy to browse on your WordPress website to better help your customers during the purchase. This plugin is created by Your Inspiratioin Theme, a very popular marketplace to download WooCommerce and WordPress themes and plugins. You can use this plugin with WooCommerce as well to clear all the doubts of your customers. This plugin creates FAQs that you can use in any place of your website using a shortcode and is compatible with WooCommerce as well. This plugin is created by HeroThemes.com. Some of very popular companies are using HeroThemes produtcs for WordPress, including Pagely, Ghost, CrazzyEgg, OptimizePress, and many more. With a very simple and drag and drop feature, You will be able to create Questions and Answers, group FAQs, and reorder items. With Heroic FAQ builder you can edit all your FAQs on one screen with visual editor, which makes is to style your FAQ’s. You can shoose from 5 pre-defined styles with unlimited configuration possibilities. This is a very affordable paid plugin, costs only $25. FAQPlus is a complete Frequently Asked Question plugin for WordPress with customizable CSS for every FAQ group. It also has 25+ easing animation effect to make FAQ section visually appealing. FAQplus can be displayed anywhere in Post, Page, Widget or Theme by Shortcode. This plugin is created by PressApps, an Elite author at Envato Marketplace. More than 13000+ customer are using their products at the time of writing this article. You can customise the color, icons, border radius, fornt sizes of all FAQs and then add them anywhere using Shortcode Generator. It comes with step by step documentation covering instalation and setup. This is another up-t-date FAq plugin that works with the latest WordPress version 5. It allows you to createnlimited FAQ’s. This FAQ plugin has a built-in search feature, that makes it easy for your customers to find answers. It has multiple color schemes and pagination system to easily manage huge FAQ sections. You can define how many items should be displayed on each page. You can even allow yiyr customers to ask question directly by adding a form on your site. 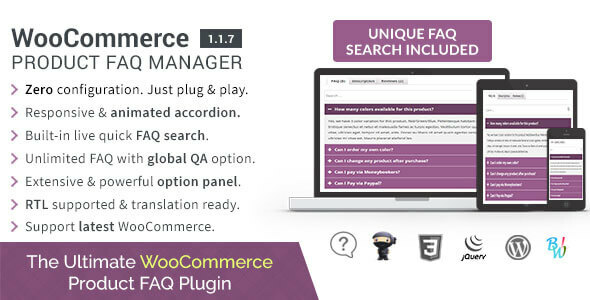 If you need an FAQ plugin for your WooCommerce based store, this is for you. A powerful, up-to-date plugin. This plugin supports WooCommerce 3.4+. Remember you need WooCommerce to use this plugin. 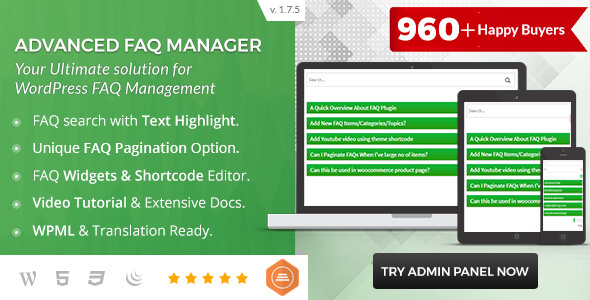 After installing and activating this plugin, You can create FAQ’s with a visual editor. Pre-made FAQ sections allows you to quickly edit and create contact info, refund policy, and other sections. Ultimate FAQ WordPress plugin requires WordPress 3.9.0 or higher and works with the latest WordPress version 5. If you want to decide exactly what order your FAQs are displayed in? Use our simple drag-and-drop reordering feature! Create SEO-friendly links to individual FAQ posts to simply direct customers to exactly the right answer, right away. If you are using WooCommerce to sell products on your blog? 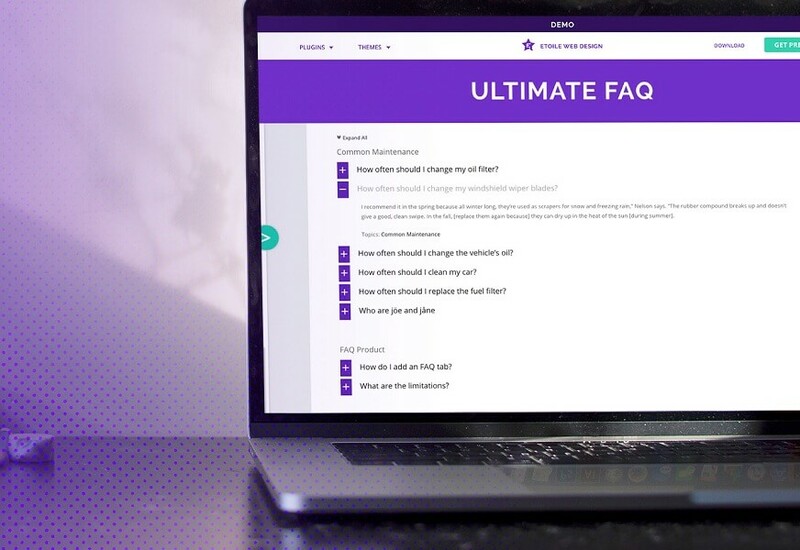 You can use Ultimate FAQ to add an “FAQ” tab to each product page, so your customers can see answers to common questions about the products they’re browsing. With 10,000+ active installs, Arconix FAQ is one of the popular free WordPress FAQ Plugin. Arconix FAQ provides an easy way to create stylish FAQ section on your WordPress website. You can display your frequently asked questions using the supplied shortcode ([faq]) and show/hide them via an animated, jQuery toggle or accordion box. Frequently Asked Questions can be loaded closed or open, and for long FAQ’s, you have a checkbox to add a “return to top” link at the bottom. With 5000+ active installations, WP Awesome FAQ Plugin is the second most popular WordPress FAQ plugin. It requires WordPress 4.0 or higher and was updated recently (Feb 2016). With WP Awesome FAQ Plugin you can create unlimited FAQ with Title (question) and Description(answer). WP Awesome FAQ Plugin uses WordPress custom post type, It will create “FAQ” section automatically upon activation. Just create all FAQ’s, create a new page and use the shortcode [faq] to display all FAQ’s. If you want to show Category based Shortcodes Go To>>FAQ Category and you will see Shortcodes like [faq cat_id=”8″]. This WordPress FAQ plugin is created by Liton Arefin and Jewel Theme. HTML5 Responsive FAQ is developed by Aman Verma and Ishan Verma. 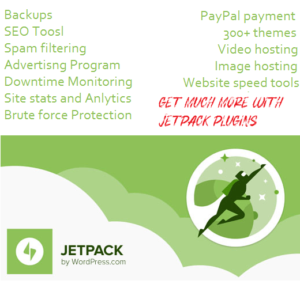 With 10000+ active install, this is 3rd most popular WordPress FAQ Plugin. With this plugin, you can create multiple category FAQs, and use them either all together in one page or category wise. You can also change the look and feel of the FAQs to match your theme style. You can create a separate FAQ page or even as a sidebar widget. With this plugin, you can even choose heading types for all FAQs. I have listed 10 most popular free and premium WooCommerce and WordPress FAQ plugins, with these plugins you can create attractive and Best FAQ Pages quickly and easily.